I am Mytria from the Violet Temple of Transmutation on Alcyone, Pleiades. I AM a higher expression of the one who is writing. I am here to remind you that you ALL have many higher expressions of your Multidimensional SELF in the fifth dimension and beyond. I encourage you all to allow your higher expressions to communicate with you in whatever fashion best suits the personality of your present incarnation. Some of you will best communicate with words. Others will be guided by another creative expression such as music, dance, art, and athletics, or working with nature, prayer and a myriad of other expressions of your innate creative force. You will know when you are connected to your higher expression by the shift in your consciousness and the release of the constant demands of your ego. We, your expressions of SELF in higher frequencies of reality, are reaching out to you to assist you during your return to your true Multidimensional SELF. We remind you to trust that your imagination, your love-filled thoughts and emotions, sudden creative ideas, and fulfilling dreams are direct messages from your SELF. Since you all have myriad higher expressions of SELF, you may feel communications from many of us. Do not be confused by these many voices, as we are all connected in the ONE to draw you into your greater experience of SELF. The Arcturians represent your tenacity to “stay the Path of Ascension,” and the Pleiadians remind you to dance, sing, create and love throughout your entire process of ascension. The Arcturians remind you of your deepest spiritual love, whereas we Pleiadians remind you to love life within every moment. Of course, both of our civilizations contain all the qualities that we have mentioned, but even Galactics have specialties. Furthermore, Arcturian realities resonate to the higher-fifth dimension and beyond where all thoughts, emotions and desires are instantly fulfilled. 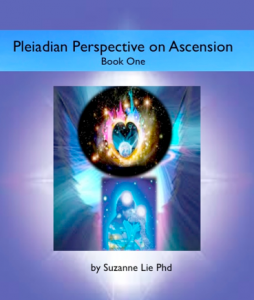 Since our Pleiadian world has ascended much more recently than Arcturus, we have taken on the honor of assisting you in creating your fifth dimensional, threshold society of New Earth. We are always very gracious to receive your donations! Thank you in advance.